I can’t believe that it’s November already, it really just feels like the other day when I was writing about my September obsessions! Nonetheless, it’s the end of the month and I thought it might be nice to share some of my favourites again. Last time I spoke about some things that I loved doing – activities like writing letters or watercolouring. It was 5 broad topics that I picked last month so I thought I would do something different this month and instead focus on my favourites in one theme! 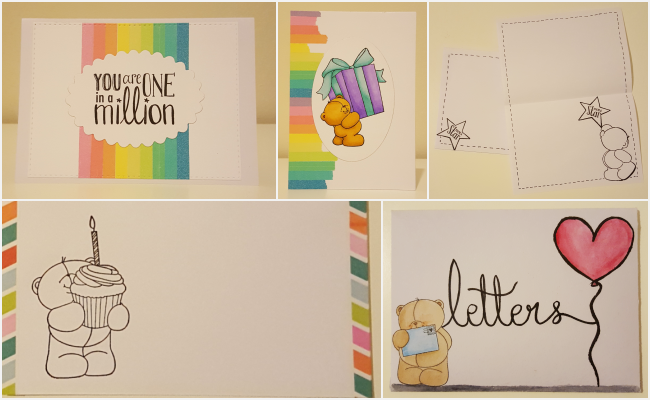 This month I have really loved stamping so I thought I’d share my top products in this area. I use the stamps in a variety of ways – from creating greeting cards or letters to decorating my planner. My focus was trying to use one set of stamps in different ways to get the most out of them. I also purchased a few new products this month, which I’m really enjoying. I’ve owned this set for a while now and really enjoyed using it for different occasions. It’s one you can use to send cards to those you love, especially with all of the cute lovey dovey sentiments but you can also use it for New Year’s or Christmas. I went one step further with it this month to see if I could do anything else with it and from that came a bunch of fun Halloween goodness! I shared a picture of these in my Halloween Planner spread last week but I absolutely love how flexible these stamps are. It was so easy to turn these cute pandas into zombies. I think this is definitely one set you’ll see featured a lot more in my upcoming crafts as I have fallen head over heels with it all over again. I think what I’ll love most about this particular set is that it contains the same animal but in many different poses and angles. This gives you the opportunity to create a whole scene of pandas or to use the one that fits your needs best. Very often, I wish that there were a few more angles of a stamp and this set provides for all of your needs. I really enjoyed creating the monsters from it and then the next day, using them as they are to add a simple design to an letter set. The Forever Friends Classic Decadence stamp set is quite new to me and yet, I’ve already played around with it more than some of my other stamp sets. Like the Pandamonium set, this too can be used for so many occasions. There are many different angles and sizes of these teddies but this time, each is carrying a different item. Birthdays, celebrations, thinking of you… whatever the occasion, you’ll probably be able to find a use for this set. There are the obvious ideas – such as the teddy with a cupcake could easily go for a Birthday card or the one with the champagne glass works for a congratulations or graduation card. But there are other ideas you could easily do from this set too… For example, you could even use the teddy at the bottom right to put the star above him on a Christmas Tree. The Greeting Farm stamps are ridiculously cute. They also have digital stamps available for download, if you prefer to print your stamps (or want to use them for digital crafts). Unfortunately, I don’t have a working printer so can’t play around with those at this moment but I do love their rubber stamps. This Do Si Do Anya is super cute. Their characters are simple but cute and you’re bound to find ones that you love. This Anya can easily be used for any occasion – just add the sentiment you want. use a different background scene or combine with other stamps to create the card for your occasion. Have I mentioned that these stamps are also incredibly fun to watercolour? It is so relaxing painting these on the sofa, whilst watching some TV or hanging out with the family. I love stamps that fill most of the card and therefore don’t require so much concentration to colour or create! These three stamps are the ones that I have really been loving this month. There are others that I have used throughout the month but these three stamp sets have really stood out for me and I have enjoyed using them in different ways. I think these favourites are the ones that I reached out for most in the month and will definitely continue to do so into the next! If you are interested in keeping up to date with crafts that I create, check out my instagram account here. Be sure to check out their website for more information about the individual stamp sets!